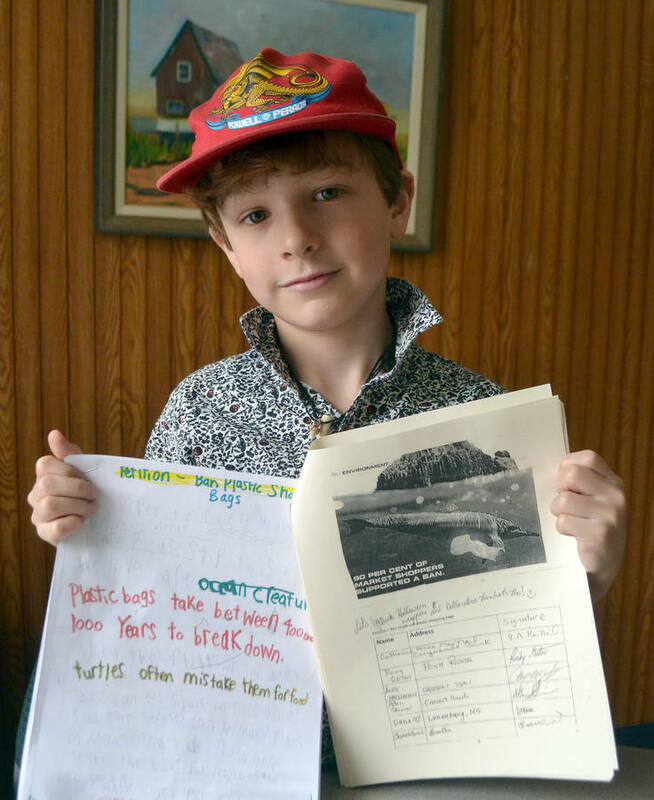 Nine year old Neco Steele presented a 238-signature petition to civic politicians in Bridgewater, encouraging town council to legislate a ban on single-use plastic shopping bags. "Sometimes the bags end up as litter fluttering in the trees, on the ground, or washing into the ocean." the Conquerall Mills boy told town council April 8. "People need inspiration, and you have the power to make this important change happen in Bridgewater and be true leaders." Neco pursued the signatures over several months; leaving copies at three businesses and posting it online. "He was bothered by the state of the planet," his mother, Sally Steele, told LighthouseNOW. She encouraged him to take action and he came up with the idea of the petition. "She's my biggest support," Neco said of his mom, crediting her with helping him advance his advocacy. The Grade 3 student at Petite Riviere Elementary School said he was "shocked" seeing so many plastic bags blowing in the wind or floating downstream. Mayor David Mitchell called Neco's efforts "fantastic" and was heartened by the positive response from the younger generation concerning a potential plastics prohibition. Neco told LighthouseNOW he appreciated the mayor's comments. "The councillors didn't really say anything, but if the mayor likes it that matters to me," Neco said. The youngster had support from his older sister, Maya, 12, the night of the presentation, who congratulated him on a great job. "Something that an older sister would say," Neco added, noting he thought of a petition as a way to "start small" in his efforts. He's now considering making a similar appeal to the Municipality of the District of Lunenburg. Single-use plastics is considered by environmentalists as a world-wide crisis and they have told politicians the equivalent of a garbage truck full of plastic enters the ocean every minute. They estimate 400 million plastic bags are used in Nova Scotia every year. Nearly a dozen municipalities are working toward a plastics ban, including Halifax, Lunenburg, and Bridgewater. Elected leaders in those regional centres have said it's for the betterment of the province and environment. Bridgewater, for example, reviewed a draft Prohibiting the Distribution of Plastic Shopping Bags Bylaw in early December but haven't yet presented it for first reading. Lunenburg is working with an advocacy group to get their legislation in place. Newfoundland and Labrador recently announced it will become the second province to ban plastic bags. Prince Edward Island's ban takes effect on Canada Day.